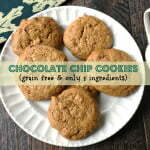 This grain free chocolate chip cookie is so easy to make because it only has 5 ingredients. The final result is more of chewy rather than a crispy cookie but it tastes great. Scoop about a Tablespoon of dough for each cookie onto a silpat or parchment paper lined cookie sheet. Let cool for 5 minutes to continue to set.